This guide helps readers identify, locate, and solve problems in the hottest avionics. The new equipment for planes is exciting - and now you can keep it all working smoothly with the best guide ever written on caring for avionics. Written by avionics specialist Edward R. Maher, this crystal-clear guide brings you: repair strategies for the dynamically changing environment of avionics in general aviation; coverage of audio noiseproofing, communications systems, GPS, sheet metal, bonding and adhesives, Stormscope, ELT's, lighting systems, instrument calibration, gyros, and more. 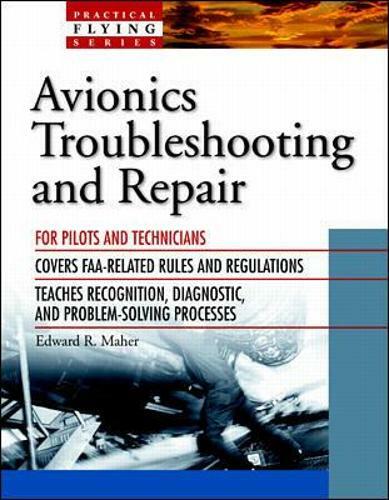 It also brings: assembly, installation, and troubleshooting techniques for use by both pilots and technicians; clear answers on what pilots can do (and when you need a certified mechanic); problem-identification, diagnostic, and repair procedures you will find nowhere else; related FAA rules and regulations, plus industry standards; and, comprehensive information on equipment and needed tools. Troubleshoot and repair the most common problems of the most popular avionics! This is a volume in the "Practical Flying Series".